One thing you can say about Apple, they seem to provide a rather steady stream of updates to their various operating systems. Today’s example is an update to OS X Mountain Lion, which brings the software to version 10.8.3. • Various fixes for issues that cause a URL to quit apps unexpectedly, that might cause Logic Pro to become unresponsive and stuttering audio on 2011 iMacs. The update also includes Safari 6.0.3, which is nice. Although, I still prefer Chrome. But that’s a topic for another day. The update is available via Software Update or through the Mac App Store. Here’s the full list of fixes and improvements. Apple Announces New iPad Mini, New iPad, New iMacs and More! Today at a press conference in San Francisco, Apple CEO Tim Cook announced some new hardware that’s sure to be on many kids (and kids of all ages) Christmas lists this year. Among the most anticipated announcements was Apple’s new iPad, dubbed the iPad Mini, a smaller verson of its mega-selling iPad. The company also announced new, improved iPad, updated iMacs, updated Mac Mini and much more. The biggest announcement, of course, was the ipad Mini. 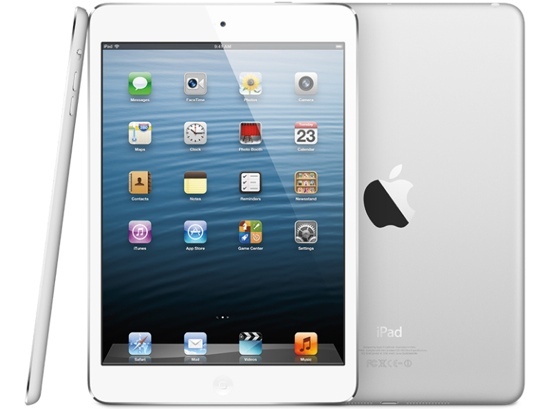 The new, smaller, iPad is only 7.2mm thick, 25% thinner than the larger iPad, and weighs just 0.8lbs. It comes in black and white models, and it’s screen resolution is 1024 x 768 just like the first iPad and iPad 2, but the screen size is 7.9-inches. 4G LTE support is available for the cellular model, an Apple dual-core A5 processor, a FaceTime HD camera on the front, and 5 megapixel iSight camera on the back with 1080p HD video capture. It starts at $329 for the Wi-Fi model and goes up from there. Still, not bad for what you get. Now that the hype over Comic-Con is ending we can turn our attentions to other things we also love as much as movies, TV and comics: gadgets and tech. This time around, for you Mac users in the audience, we’re getting word from various sources that the next version of Apple’s OS X (aka Mountain Lion) is going to launch as soon as July 25. On of the main sources for the this news are the folks over at 9 to 5 Mac who’ve heard that Apple Stores both in the United States and overseas are planning overnights for Tuesday, July 24th. They speculate that with Apple promising Mountain Lion “in July”, it makes sense that said overnights would lead to a launch of the OS on the following day. We think this is pretty sound speculation too and follows many of Apple’s previously established release patterns for these types of updates. Plus, the Gold Master of Mountain Lion has already been released to developers (we’re running it on some of our Macs in fact), so that means the software is ready to go. Mountain Lion is a great upgrade and offers a bunch of new features sure to please long time Mac users as well as newcomers. We hope Apple decides to let it into the wild soon. Mac OS X 10.8 Mountain Lion will be a $19.99 upgrade for all users. For more on Mountain Lion, check out Apple’s website. Apple today released details of the next version of its Mac OS, also known by the more technical name as Mac OS X 10.8, and they are going to be good news for those of you wishing your Mac was more like your iPhone or iPad. Some of the highlight of the new release include the arrival of iMessage on the Mac as well as Notification Center. Other new features include Game Center integration, AirPlay mirroring, enhanced iCloud support and a number of redesigned apps. A developer preview of OS X 10.8 Mountain Lion will be released on Thursday of this week and the updated OS will become available to end users this summer. For more, check out the full press release from Apple after the break.